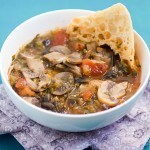 Thick, hearty mushroom soup from Herzegovina. A nice vegetarian option from the Balkans. Serve with red wine and toasted garlic bread. Most of the Balkan, Eastern and Southeastern Europe cookbooks written in English are laughable. I’ve built a collection over time, and am yet to find a decent one. Most recipes supposed to be from the former Yugoslavia, or the Balkans, make no sense. I’ll give you a really small example. One cookbook suggested making pita the same way you’d make a strudel. I sometimes want to call up these authors and be like “You’ve never actually had Balkan food, have you?” I hate on them so hard they were a part of my motivation to start this blog. BTW, a surprisingly good cookbook was compiled by WWI soldiers on the Isonzo front, present day Slovenia. Everyone contributed recipes from their homeland so it encompasses meals from everywhere, including many recipes from the Balkans. If one is to assess from the cookbook, Great War soldiers were doing pretty well for themselves food-wise. Cookbooks in Bosnian/ Serbian/ Croatian tend to be good, but that won’t help you if you don’t know the language. If you do and want a recommendation, one beloved classic is the Bosnian Cookbook by Alija Lakišić. It’s a tome really, and probably the most comprehensive cookbook of Bosnian cuisine I’ve come across. This book covers everything from soups to desserts, in a straightforward way that helps even the beginners succeed making legitimate recipes from the first try. This summer I discovered another favorite at a book fair. Loosely translated it’s called All Over Ex-Yu With A Fork by Mika Dajmak (bibliography below). If you can get your hands on this book, do it now as the print ran for 1,000 copies only. It’s a thorough review of local favorites for every region in the area, accompanied by a rather sweet, nostalgic commentary. I’m not crazy about the photographs, but the cookbook itself is a treasure chest of tried and tested recipes loved across the region. Unfortunately this one doesn’t seem to have been translated either. So I went ahead and translated (and slightly adapted) a recipe from the book, along with the beginning of the chapter, introducing the region the recipe is from. A note: this soup is hard to categorize. It’s both thick due to many ingredients, but not creamy. If you combine it with toasted garlic bread and some red wine it may be enough for a meal. The most beautiful road to the Adriatic ran through Neretva’s riverbed. Since the Adriatic was our second address at least once a year, it was completely logical we would change roads to get there: over Cetinje, and then via Adriatic highway to Rijeka and on to Istria. It all depended what we wanted: Montenegrin lozovača (vine brandy), Mostar travarica (herb brandy), or Istrian grappa. Now, we go back to the road via river coast of the legendary river from the fourth enemy offensive (partizans are moving back, Germans are chasing them; Tito demolishes the bridge, our engineers making a rickety one to cross to the other side; Germans stop because they did not have intentions of crossing in the first place; Tito says “Someone will proclaim this to be a genius strategic move”; then starts the bloodthirsty war…) where during peacetime every ten kilometers or so boys are offering entire branches with cherries as if from a postcard, and also every ten kilometers, just to tickle the imagination and seduce travelers, a lamb-roast. And everyone was working, earning money, and was satisfied. In Opuzen my friend technologist-enologist Kira executed two harveting of žilavka and blatina (wines from the region). Then he decided to return to Belgrade, and took with him a canister of blatina, which with indescribable satisfaction, with the help of future geologist Maja and future doctor Silvana we drank to the bottom. Perhaps nowhere in the entire world the fruit is not that big and sweet, wine so smooth, perhaps no other bridge in the world was the target of so many postcard photographers as was the one in Mostar. Perhaps there is no other song such as the one from Pero Zupac with which we conquered the above mentioned Maja and Silvana (In Mostar I loved one Svetlana one fall/ If I only knew who she sleeps with today/ Off with his head, off with his head/ If I knew who she kisses today/ Out with his teeth, out with his teeth…), perhaps no one put together more beautiful odes to his city than the man born in the Ottoman Empire, who died in the Kingdom of Serbs, Croats and Slovenes. Only the city never changed for him. His name is Aleksa Šantić. I don’t know if the poet savoured eel, but nowhere except in Mostar did I have a chance to try them. Alas, I’m lying: in Dubrovnik at Prijeko, the last cafe-restaurant as one is leaving the city is owned by a guy from Mostar who always had eel risotto. I don’t know if the poet savoured wines (knowing the poet soul, I don’t doubt this), but to say all this together is one unrepeatable adventure – is true. Will I have a chance to repeat this adventure – I don’t know. I know only that the cafe-restaurant from above does not exist anymore, that everything was turned into a row of monotonous so-called fancy restaurants where something is made real’ fast, and you’re sent on your way. If there is even an ounce of truth in the supposition that delta of Neretva and Adriatic is the real Troy, and if, and most probably it is, on the foundations of the first city that burned down sprouted seven more, then it this was clear even then: they are receding, the other ones are chasing them; artillery is demolishing the bridge, there are no engineers to make ricketiness and cross over to the other side; everyone stops because they did not have any intention of crossing over… bloodthirsty war has been going on a while now. I remember an American magnate who went to see the Acropolis, and said “So what? We’ll make a newer and nicer one!” And he did so. Those who demolished the bridge made a newer and nicer one. But, there is nothing left of that. 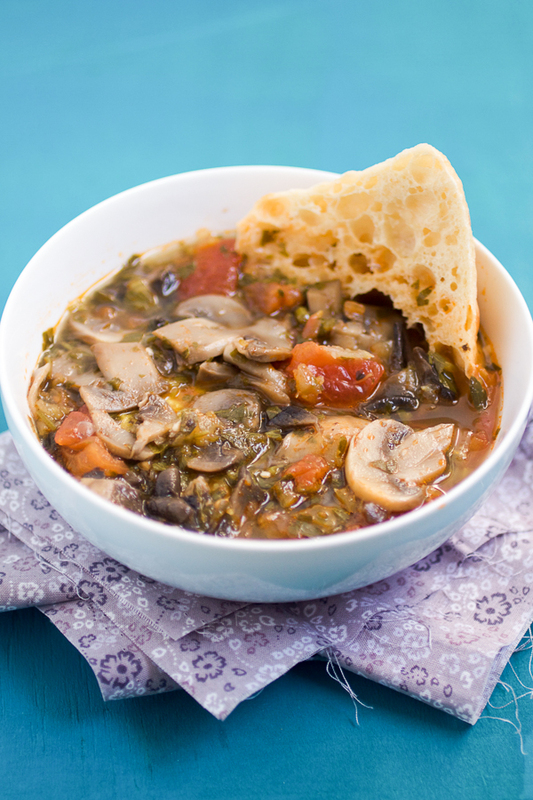 Another vegetarian soup we love to show off is the simple, delicious EGG DROP SOUP that takes minutes from start to finish. There’s also the CLASSIC MINESTRONE. It’s your choice to keep it vegetarian or to enrich it with ground beef for a meatlover’s lunch experience. 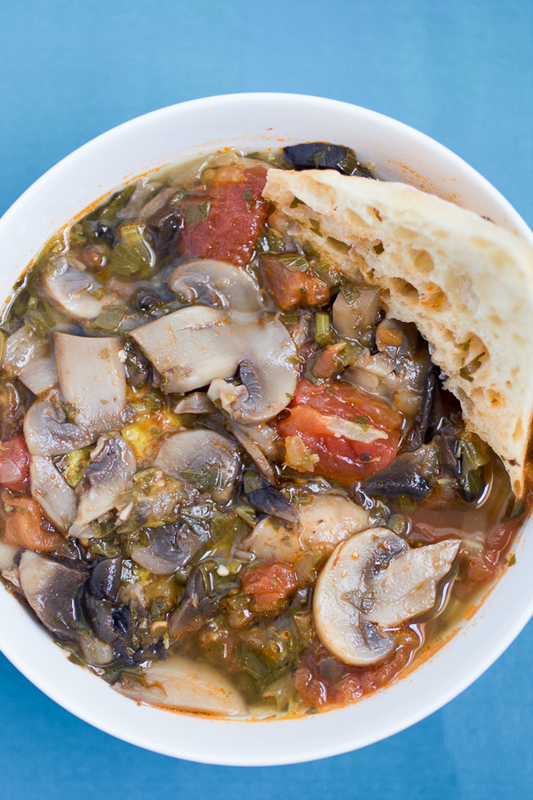 If you crave more mushroom goodness, another great soup option is the CREAM OF MUSHROOM. And for a full meal you can do the MUSHROOM RISOTTO IN WHITE WINE. 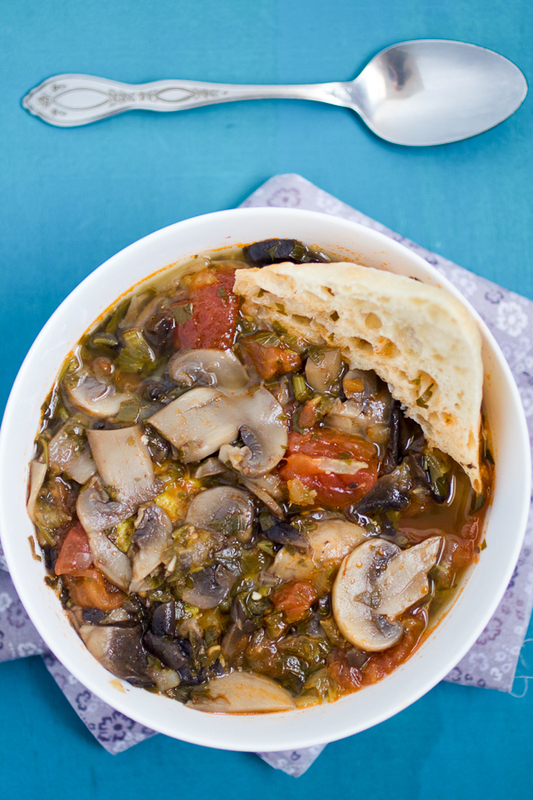 Finally, there’s also the MUSHROOM GOULASH that is a recipe that you won’t find just anywhere. However it may become your favorite go to sauce with pasta, polenta or rice. In a deep pot, simmer garlic on 2 tablespoons of butter over medium. 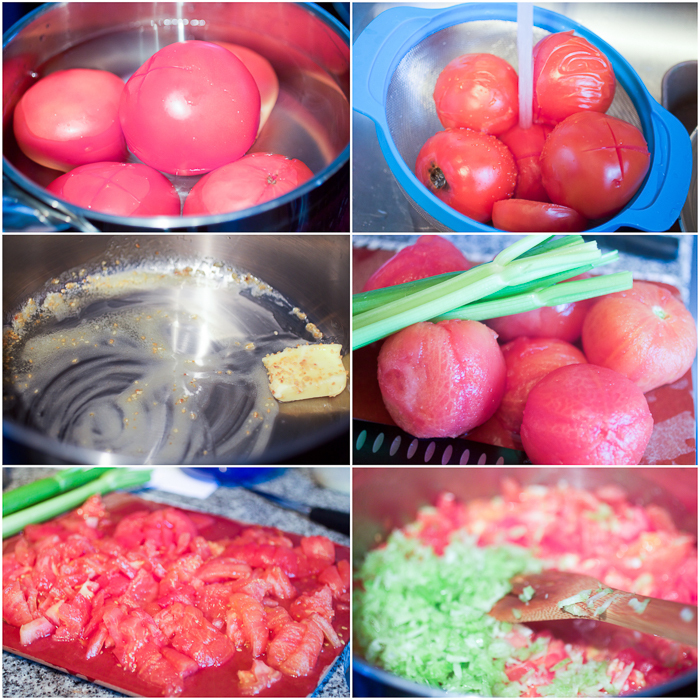 Add tomatoes and celery. Simmer 10 minutes, stirring frequently. Add 5-6 cups of water. Continue cooking on medium. In a pan heat up remaining butter over medium and add mushrooms. 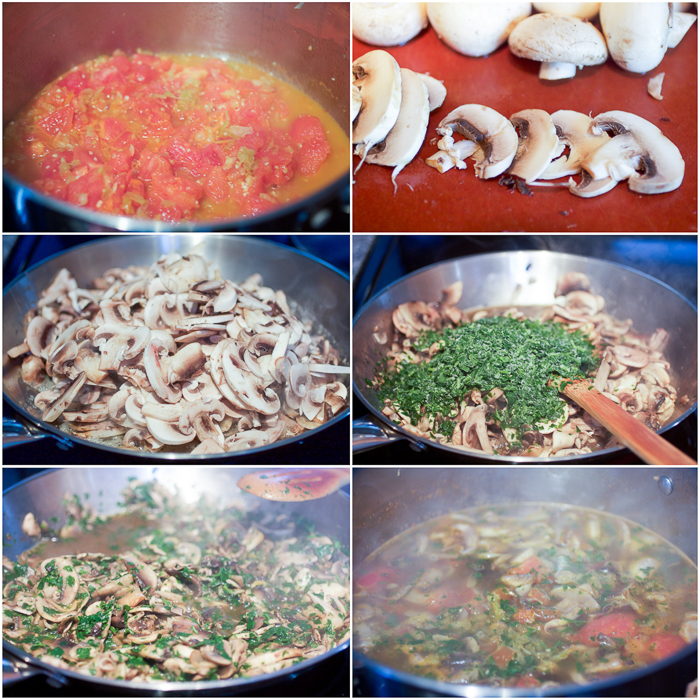 Simmer until mushrooms are soft (10 to 15 minutes). Add seasonings and stir. 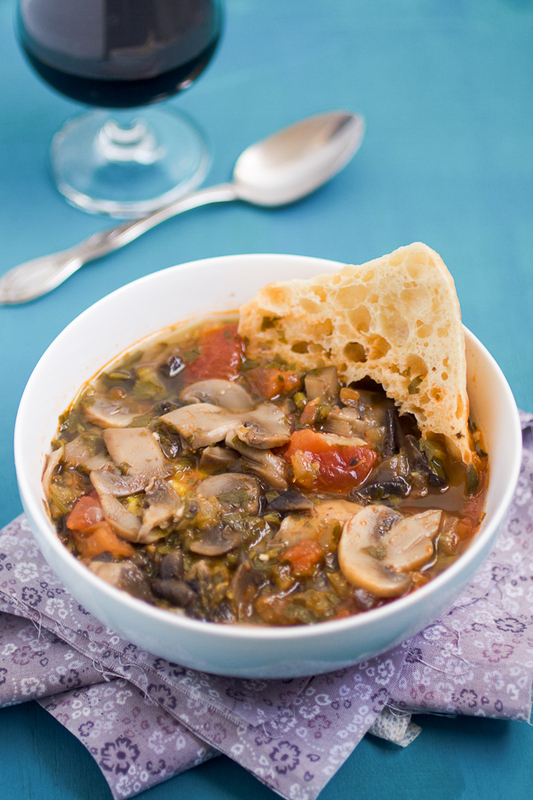 Combine mushrooms and parsley with the rest of the soup and bring to a boil. Reduce heat, and simmer another 20 minutes. Serve with toasted garlic bread, and a glass of red wine. Keto: instead of seasonings, use sea salt. Paleo: instead of seasonings, use sea salt. Vegan: instead of butter use olive oil. The PDF link is not working to the WWI cookbook you reference Can you correct and add again? If it cannot be DL, they must have removed it from their site. Contact them directly.